"A simple recipe for extra garden vegetables. Add fresh sweet corn or other favorite vegetables if you like. Great over a bed of spring mix." Toss sliced cucumbers, red onion, tomato, and corn in a large salad bowl. Stir in mayonnaise, vinegar, and olive oil, and season with garlic powder, salt, and black pepper. 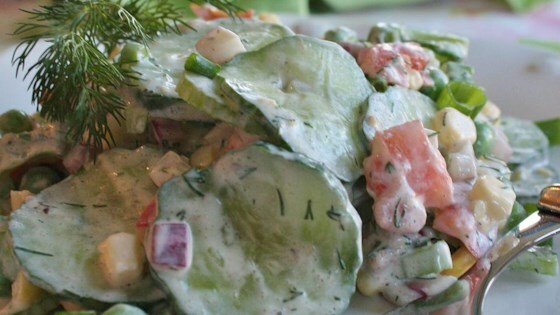 Toss salad again to coat vegetables with dressing. Loved it! I added a tablespoon or so of sugar along with red and yellow small peppers. I was great. I agree with kelliann. The cucumbers would have been better quartered. This would have been better if the cucumbers had been quartered and sliced. Very excellent! My husband had three servings so that tells you how good it was. Also, I did add a little bit of sugar as well to help drown out the vinegar. Over all, I would make this again! always find it odd that people use low fat mayo then add oil, also I assume they used the corn raw as it does not state to cook first. Will be trying as soon as a tomato ripens. Loved it!! Added diced avocado and fresh herbs and it was divine!